Whether through tooth decay or injury, there are times when multiple adjacent teeth have become damaged beyond repair, or simply beyond the reach of traditional restoration techniques. In those instances, porcelain fixed bridges can be a life-saver, or at least a smile saver. When you have one or more teeth that are no longer able to be repaired, they can be replaced with a fixed dental bridge, restoring a natural, beautiful look to your teeth. What Is A Porcelain Fixed Bridge? Porcelain fixed bridges are a restorative dental technique that uses a high-grade dental porcelain to sculpt a nearly identical replacement for your missing teeth. Using these methods it becomes possible for your dentist to restore your smile to its natural state, or even improve on it if you found your original teeth aesthetically displeasing. Porcelain is a highly dynamic material, capable of being used to replace those lost teeth, or shaped into the smile of your dreams with a replacement that is beyond compare. Why Would I Need A Porcelain Fixed Bridge? In instances where you have missing teeth and are either not wanting to get a partial denture, or where one isn’t appropriate for your dental needs, a porcelain fixed bridge can become a potential solution. This restorative technique uses the teeth adjacent to the missing teeth or tooth as a grounding point for the restoration. Using these points a bridge is created to replace the teeth. These replacements are excellent for many patients thanks to their ability to recreate a natural chewing experience and a beautiful smile indistinguishable from their original beautiful smile. What Are The Benefits Of A Porcelain Fixed Bridge? The benefits of this type of restoration are many, starting with the ability to create a smile that bears a high resemblance to your natural teeth. It is durable and resilient and is resistant to future damage and staining. Additionally, they are easy to maintain, requiring only the same regular brushing regimen as you would use with natural teeth. Are There Any Drawbacks To Having A Porcelain Fixed Bridge? While it is always preferable to have your natural teeth, the drawbacks to having a porcelain fixed bridge are few. The biggest concern is that these restorations, like all restorations, are not as durable as your natural teeth due to a loss of flexibility. For those patients who experience grinding of their teeth or jaw clenching while they sleep, a mouthguard may have to be obtained to prevent the bridge from fracturing under the pressure. In addition, some harder foods may have to be avoided. Consult with your dentist if you have any concerns. 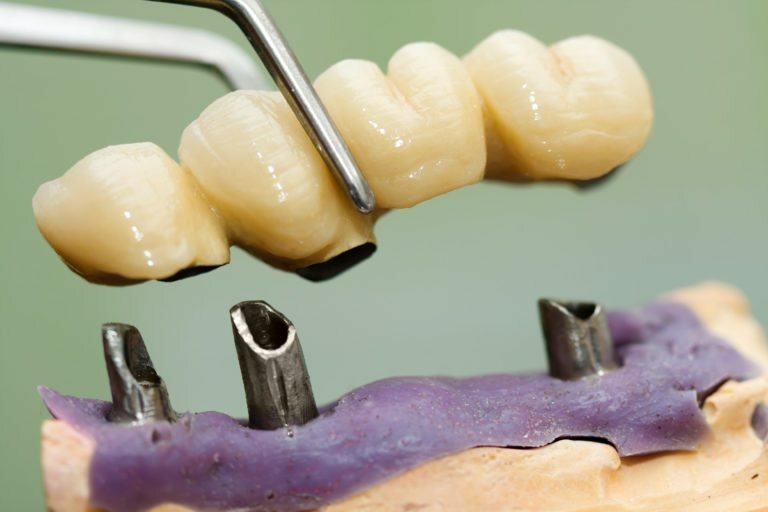 Porcelain fixed bridges are an incredible innovation in restorative dentistry, providing the opportunity to have a beautiful smile even when multiple teeth have been lost. Be sure to take care of your natural teeth as long as possible, they’re simply irreplaceable. In the event that restorative dentistry is required, speak to your dentist about using porcelain for your restorations.